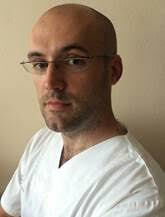 Anton Glasnović, MD, PhD is a neurology specialist and and employee of University of Zagreb School of Medicine. He worked on Department of Neurology, Clinical hospital “Dubrava” from 2007. up to 2015. His main scientific interest is neuroimmunology and he is also in official educational process to be a psychoanalyst. He has been working in the Croatian Medical Journal as one of the executive editors responsible for manuscript editing. Also pursues career as a jazz guitarist with various bands and musicians, and performed with most of the prominent Croatian jazz musicians.